The citrus canker season is quickly approaching again, so it is time to start preparing your canker management plan. It is easy to forget the importance of controlling citrus canker with the current state of HLB in Florida. However, citrus canker can cause almost complete crop loss if environmental conditions are favorable for disease early in the season. This crop loss is not just a fresh fruit problem. If fruit are infected in the early stages of fruit expansion, the large lesions produced can induce midsummer fruit drop. With properly timed and applied management, midsummer canker fruit drop can be greatly reduced while protecting yields and, in the case of fresh fruit, quality. This article describes the conditions that lead to canker production, effective management tools and the pitfalls that can lead to a control failure. In order to develop the most effective canker management strategy, it is important to remember how and when the bacteria spread and infect new tissue. To get new infections, the bacteria has to be moved from existing leaf lesions and stem cankers to new tissue through water. This can happen by splash dispersal during a rainstorm or on people or equipment when dew is present. The bacteria can infect any green tissue or fruit that is expanding or wounded. The most susceptible tissues are young, expanding leaves and fruit. While both are susceptible, fruit expand at a much slower rate, making it easier to maintain coverage of control measures, which will be discussed below. The difficulty in predicting infection events is tied to the difficulty in predicting if rain is going to fall at any given location in Florida. The amount and timing of early-season rains can have large effects on canker pressure in any given grove. With the increased variability of flowering because of HLB, it also stretches the length of the season with highly susceptible fruit. Depending on a year’s weather, this could increase the time when Hamlins need to be protected to prevent summer fruit drop from canker. To date, copper is still the most effective registered management tool for citrus canker. Insoluble coppers are highly effective and provide a good barrier to canker infection, with the exception of strong windblown rains. The major limitation of copper is that it forms an immovable film on the fruit and leaves. As the leaves and fruit grow, this film cracks, leaving unprotected tissue that is susceptible if a rain event occurs. To maintain good copper coverage on susceptible tissue, reapplication is essential. The general rule of thumb for fruit is that reapplication of copper every 21 days will maintain good copper coverage on the expanding fruit and maintain effective concentrations with average Florida rains. Although leaves are the major source of inoculum for fruit infection, they cannot be actively protected with copper because keeping good coverage on the actively expanding flush is not economically or logistically feasible. Systemic acquired resistance (SAR) inducers offer an opportunity to reduce leaf infection because of their systemic activity. In young trees, the SAR induction of neonicotinoids used to protect against psyllids can provide some reduction in leaf inoculum buildup. Actigard is a labeled SAR inducer that is an option for canker management. For Hamlins, the main concern is early-season infections that can cause summer fruit drop. Citrus canker does not affect juice quality. To protect these fruit, it is important to spray them with copper every 21 days from shortly after fruit set to June, when the fruit has expanded past the half-inch diameter and is no longer at risk of high rates of fruit drop. Figure 1. 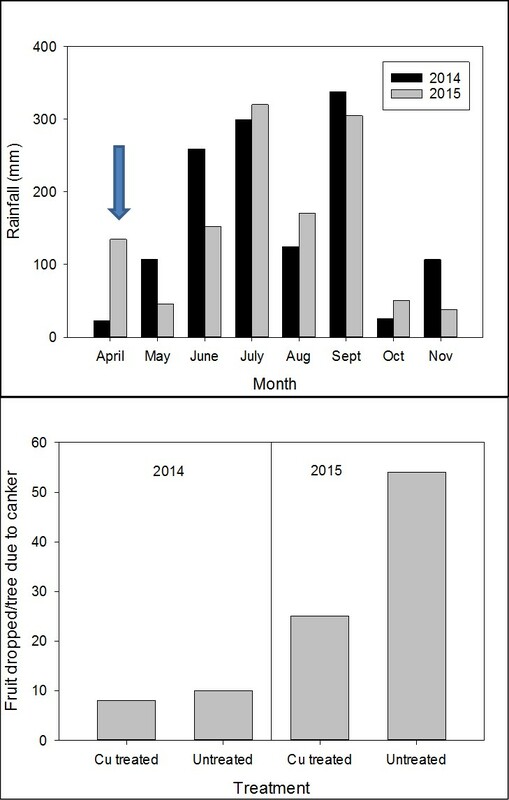 Yearly variability of rainfall and fruit drop from a Hamlin canker trial from 2014 and 2015 (courtesy of Jim Graham). Note the unusually high rainfall that occurred in April 2015. Citrus canker is not a problem every year in every location because of variability in April and May rains (Figure 1). However, it is important to have a good management program in place because weather conditions can change rapidly. By the time the rain is forecast, it could be impossible to protect all of your acreage in time. The lack of a consistent canker management program in some Hamlin groves over the last few years has resulted in some cases of near total crop loss that could have been prevented. Canker severity is extremely dependent on weather conditions at optimal infection times, and management should be based on the likelihood of favorable conditions. Under extremely favorable early-season conditions, Valencia can be heavily affected by citrus canker (Figure 2), but the necessary environmental conditions are rare in Florida, so it is not usually worth developing a specific management plan. There is limited information on some of the new sweet orange varieties, so determine your own risk level. However, I would recommend treating them with a Hamlin program until we have more experience with these varieties. Figure 2. Severe canker infection of Valencia sweet orange in Paraná, Brazil, where weather conditions are highly favorable. While processed fruit only needs to be protected until midsummer to avoid fruit drop, fresh fruit generally needs to be protected season-long. Canker lesions can form on much older fruit, but they will be smaller and won’t cause fruit drop. These lesions reduce peel quality and can reduce packout or shunt the harvest to juice, leading to a substantial crop-value reduction. Especially for grapefruit (highly susceptible to canker), it is important to maintain 21-day interval copper sprays through the season into the fall, when fruit expansion is done and rains are less frequent. In the heat of the summer, risks of damage to the peel from heat-induced copper toxicity and canker development have to be weighed. The most important part of canker management is maintaining the protective barrier of copper at effective doses and coverage. The 21-day interval is designed to maximize the efficacy by covering areas exposed by fruit expansion while maximizing the time between sprays. However, it does not take into account rainfall that can wash copper off the fruit and dilute its efficacy. To help determine if a grove still has adequate protection, growers can use the copper application scheduler (http://agroclimate.org/tools/Citrus-Copper-Application-Scheduler). This web-based app can help determine if good copper coverage remains after major rain events. It can also help ensure good protection throughout the problematic canker season, whether it is for fresh or processed fruit. Evan Johnson is a research assistant scientist at the University of Florida/Institute of Food and Agricultural Sciences Citrus Research and Education Center in Lake Alfred.